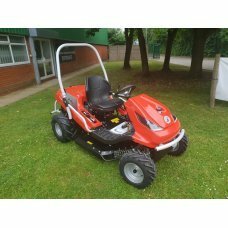 Designed to take on the most challenging mowing and vegetation clearing applications, this truly impressive, all-terrain tractor from Italian brand-leaders Efco offers exceptionally robust build-quality, develops huge amounts of power and incorporates a number of features that will make the operator’s life a whole lot easier. It’s driven by a very high-performance 627cc (23hp) Briggs & Stratton Vanguard V-Twin engine; an overhead-valve unit with a two-stage air-filter for long-term reliability; and sintered cylinder-sleeves for reduced oil-consumption. The Efco Tuareg 92 Evo has a locking-diff and a 4x4 capability, so you’ll be able to negotiate the sort of terrain that would defeat a conventional garden tractor. Its low-centre-of-gravity and extra-wide deep-tread tyres serve to maximise stability on tricky inclines; while the incorporation of a pair of side-impact guards, a seat-belt and a roll-bar works to maximise operator-safety. Thanks to its foot-operated hydrostatic transmission, the Efco Tuareg 92 Evo 4x4 Professional All-Terrain Garden Tractor is easy to control and manoeuvre in both forward and reverse gears. The five-stage cutting-height (50–90mm) is centrally controlled from a conveniently located lever, so it’s quick and easy to make the necessary adjustments; while the blade is engaged via an electromagnetic clutch for reduced wear and therefore a longer life. The 92cm blade is a heavy-duty swing-tip type unit that’s capable of scything through thick grass and dense vegetation.